Place the charcoal into the bottom pan of the smoker. Light the coals and wait for the temperature of the smoker to come to 240 degrees F (115 degrees C). Lightly oil grate. Rinse turkey under cold water, and pat dry. Place hickory chips into a pan with water to cover. Place turkey onto the prepared grate. Add 2 handfuls damp chips at start of cooking, then a handful every couple of hours during the cooking process. 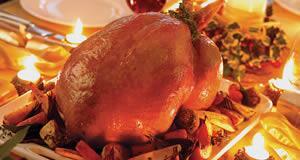 Leave the lid on - DO NOT keep looking at turkey, or you will let the heat out! Continue smoking until the internal temperature of the turkey reaches180 degrees F (82 degrees C), or keep going until the coals die out. Wet hands with water and dampen top of pie. Sprinkle with additional sugar. Puncture top of pie with fork so pie will vent. Bake for 15 minutes at 450 degrees F (230 degrees C), reduce heat to 350 degrees F (175 degrees C) and continue baking for about 45 minutes more, until crust is golden brown. It's a good practice to place a piece of aluminum foil slightly larger than the pie under the pie plate to catch overflows. Serve warm.